Dramawa - What makes beqne basics nippers the best choice? forging duty stainless steel construction Hand-sharpened cutting edges Precision-aligned blades Over 18 years of design Tired of losing control?Optimum width handle: Unique grip of forging texture makes for no-slip trimming 3" length fits comfortably in your hand Less pressure needed to clip You deserve to be pleased with your product. Cuticle trimmer cuticle remover tools are made of cuticle nipper 100% Surgical-quality stainless steel, cuticle nipper ergonomic handle design. Ergonomics grip with protective coating provides enhanced rust resistance and increases tool-life; the coating also reduces friction, which contributes to durability and ease of use. 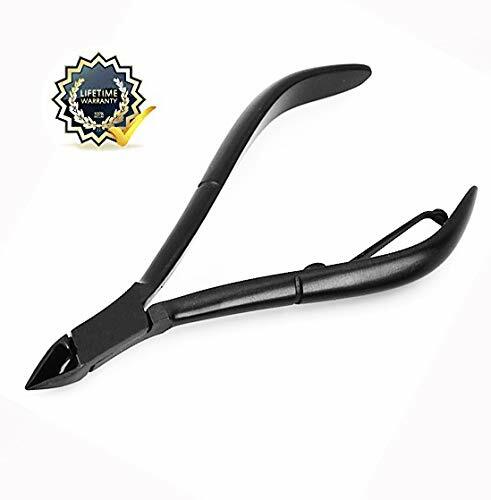 Cuticle Nippers 1/2 Jaw Extremely Sharp Cuticle Trimmer Scissors Stainless Steel Nail Clipper Cutter Remover Pedicure Manicure Tool,Black - They are sharp, sophisticated tools build for the last longer. Collect this ultra-sharp, no-pull nippers that will not likely to break or corrode, you'll feel how amazing tool you got to keep in your beauty salon or beauty box. If you are unhappy in any way, simply contact us for a replacement or full refund. Get one today for you, a loved one or friend! Cuticle nippers ultra-sturdy, high-performance blades make snipping excess cuticles easy and precise; finely hand-filed ultra-thin to perform with advanced accuracy. These nippers were designed to help you get the job done quickly and easily. Maintain healthy nails with confidence.